1. Who is billed for the mobile home taxes? The person living in the mobile home as of January 1 of the tax year billed is responsible for paying the mobile home taxes. 2. When does the tax bill come out? The mobile home tax bills are mailed during the first week of March and are due 60 days after the day they are mailed. 3. What do I do if I do not receive a tax bill? Mobile home tax bills are mailed during the first week of March. If you have not received a bill by the middle of March, please contact our office. 4. What is the billing year for mobile homes? The mobile home taxes are billed for the current calendar year, which runs from January 1 to December 31. 5. How are mobile home taxes calculated? Mobile home taxes are determined by the age of the home and the square footage of the mobile home. 6. Do I qualify for any exemptions? You must be 65 on or before January 1st of the year taxes are being billed to qualify for the senior exemption, which will reduce your taxes by 20%. There is also an exemption if you are totally disabled. To apply for the exemptions, you must complete the reverse side of the mobile home registration form. Please contact our office for additional information. 7. What method of payments do we accept? We accept personal checks, cashier’s checks, cash, and money orders for mobile home taxes. Payments must be made in full; no partial payments will be accepted. We can accept only a cashier’s check or cash within 30 days of the tax sale, which is usually held on the last Monday in October of each year. 8. Do you accept postmark? Yes, we do. Be sure to mail your payment on or before the due date. If you mail your payment on the due date, it is strongly recommended that you take your payment inside the post office and have them hand cancel it at their counter. 9. What do I need to do when I purchase a mobile home? 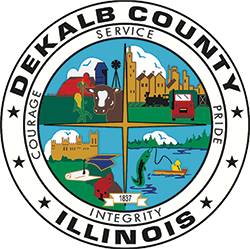 A DeKalb County Mobile Home Registration form must be filled out and returned to our office within five (5) days of occupancy. The mobile home park manager has a registration form that can be completed and returned to us. The form can also be downloaded from this website, or can be requested by calling our office at 815/895-7112. 10. What do I do when I want to sell my mobile home? The current taxes and any prior year unpaid taxes must be paid in full before you can sell a mobile home. Once the taxes are paid in full, you should contact the Treasurer’s Office to request a tax certification form. The tax certification is required by the Illinois Secretary of State’s office in order to transfer the title of the mobile home to the new owner. The tax certification can be mailed to you, along with a DeKalb County Mobile Home Registration form. The new owners should complete the registration form and return it to our office within five days of their date of occupancy. There is no charge for a tax certification. 11. What do I do when I want to remove my mobile home? The current taxes and any unpaid back taxes that are owed must be paid in full before any mobile home can be moved or demolished. You will need to contact the Treasurer’s Office to request a moving permit. This permit will verify that all taxes on the mobile home are paid in full and it can be moved or demolished. There is no charge for a moving/demolition permit. 12. What happens if I cannot pay my taxes? The tax bill is mailed in March, and you have 60 days to pay the taxes without penalty. If the taxes are not paid by the due date, by law a $25.00 delinquent fee is added each month until payment is made. Payments must be in our office by 4:30 p.m. on Friday prior to the tax sale, which is usually held on the last Monday in October, to avoid tax sale.